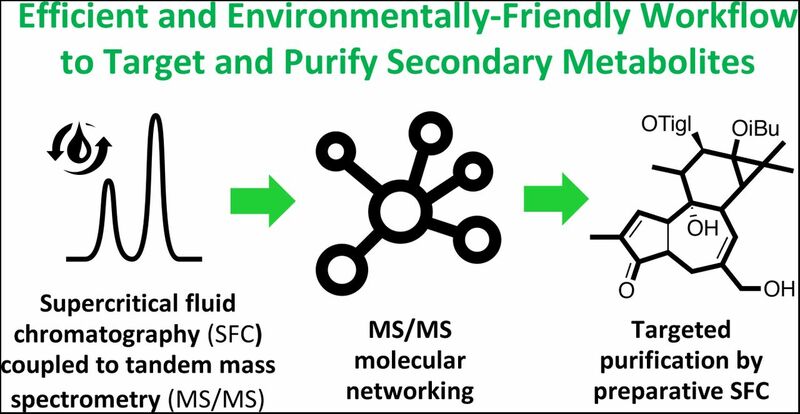 A supercritical fluid chromatography-based targeted purification workflow using tandem mass spectrometry and molecular networking was developed to analyze, annotate and isolate secondary metabolites from complex mixture. This approach was applied for targeted isolation of new antiviral diterpene esters from Euphorbia semiperfoliata whole plant extract. The analysis of bioactive fractions revealed that unknown diterpene esters, including jatrophane esters and phorboids esters, were present in the samples. The purification procedure using semi-preparative-supercritical fluid chromatography led to the isolation and identification of two jatrophane esters (13 and 14) and four 4-deoxyphorbol esters (15-18). Compound 16 was found to display antiviral activity against chikungunya virus (EC50 = 0.45 µM), while compound 15 was found to be a potent and selective inhibitor of HIV-1 replication in a recombinant virus assay (EC50 = 13 nM). This study showed that supercritical fluid chromatography-based workflow and molecular networking can facilitate and accelerate the discovery of bioactive small molecules by targeted molecules of interest, while minimizing the use of toxic solvents.